Just call it Elvis Parsley… This versatile herb literally gets any dish “all shook up” with flavor. It’s easy to grow, harvest and preserve. While it can be a garnish, Italian Parsley is a hero in heavy comfort dishes during the winter and lighter fare in the spring. With its light, herbaceous, slightly bitter flavor, parsley is easy to use in almost any meal. Give it a try in your morning smoothie to perk you up and cool you down from your morning jog. Sold at the peak of freshness. 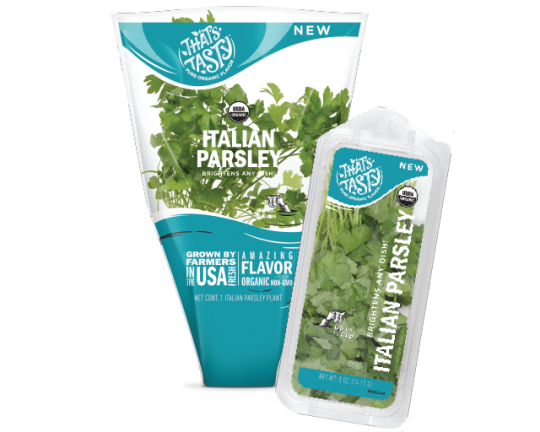 Our Italian Parsley is grown and sold to be used right away for the best flavor. Stop loving parsley for its looks alone! Quisque a tellus nec tortor fringilla feugiat. Suspendisse velit augue, varius et molestie ut, fermentum in lectus. Vivamus nec placerat. Have extra ______? No problem. Try these fresh ideas for how to use it quickly. An Idea. Nulla facilisis nibh vitae quam feugiat maximus ac nec lorem. Donec quam felis, ultrices ut! Another Idea. Phasellus pulvinar suscipit lorem, sit amet facilisis lectus congue! A Third Idea? Nam nec laoreet turpis. Donec quis mollis dui. Nam a sem eu!